The Wild Hunt has begun and you may be its next prey! As powerful spirits threaten to destroy the world, you and your companions must learn the secrets of the Wild Hunt to save the world from utter destruction. Can you uncover the truth about the power behind the hunt, or will you fall victim to its ghostly pursuers? 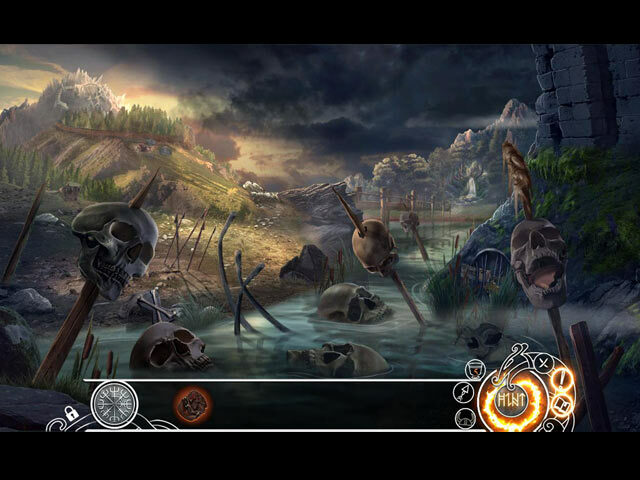 It’s time to journey through the Nine Realms in this stunning hidden-object puzzle adventure game! Climb aboard Naglfar, the Ship of the Dead, in the bonus game! Tons of souvenirs and collectibles to find! Earn achievements and replay HOPs and puzzles. 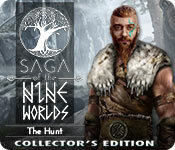 Saga of the Nine Worlds: The Hunt Collector's Edition is rated 3.3 out of 5 by 18. Rated 5 out of 5 by Talisbird from Great addition to the collection My ratings are based on the level of satisfaction I felt when playing this to the end. I realize that this would not be for everyone. It is story and mini games rich. I thought the puzzles were excellent at a varied levels of difficulty. There is a significantly lesser number of HOP's, and they were not over difficult by comparison, but they were very attractive. The graphics suited the moody brooding atmosphere and in parts there is some mistiness, but it was in keeping with the theme. Rated 5 out of 5 by own2sphynx from Awesome game Awesome game...sad ending...I love Norse mythology and I hope this game is the end in this series. Rated 5 out of 5 by yanochka from Good stories can develop slowly Ok, i am not talking about the actual game play, see for yourselves. Sufficient to say that puzzles are not too challenging, but rather inventive and HOP are very well integrated in the plot. I can see why this game could be not to everyone's taste, but if you have any interest in Scandinavian sagas, like I do you will enjoy it. it is slow all right but totally gripping and a good attention for detail, Not sure that the vikings had bolt cutters, but for me this is a minor setback, I suggest that you try but dont expect anything to happen too quickly. I just hope that this is not the last one in the series, You have to play to the end to see why i think it might be so. Rated 5 out of 5 by LogieBaby from gonna grab me a bow, some arrows, a tracking device and a call as I am on a HUNT !! This is the 3rd installment of Saga of the Nine Worlds. IMO the 1st game is outstanding while the 2nd failed somewhat to warm the cockles of my heart. Fortunately this 3rd edition restores my feelings for Saga as The Hunt ( at least the demo ) is fantastic. Once again the player is in the midst of the Seer, Skald and the Huntress and the HUNT involves a quest to find and defeat not so dearly departed beings who are bent on destroying the world as we know it and drop everything into a abyssmal void. During the demo the player acts as the Huntress and she must return to her own people to gain assistance from her kind and also restore her image to the great god ULL. She, of course, must coordinate her efforts with folks met along the way and gather items and forge things necessary to her quest. For starters The Hunt is stunning on the eyes as everything encountered is extremely lifelike. I am a bit surprised that there is not one hidden object segment in the demo but this fact does in no way diminish the excitement this game holds for me. There are loads of puzzles, the variety of which HOPA players have seen quite often. The manner in which these are presented while not unique offer entertainment and some degree of challenge that is a key factor in any very good game. I suppose The Hunt includes morphs and collection items yet I became so engrossed in the quest itself that I did not bother to look for any extraneous items which as we all know well enough hardly ever impact the game. Players who relish more of an adventure saga than merely facing constant HO segments should truly enjoy this hunt. Being entrenched into more Norse mythology along the ride is an added enjoyment to a fantastic game. Rated 5 out of 5 by rainworm from Shoulder your weapons, warriors Ready for another class in Norse Mythology? The fantastic four, the huntress, the shield maiden, the seer and the skald, have a new task: The Wild Hunt is lose, interfering with all rules, set by the gods. So Odin needs help again. Who is our opponent: The Wild Hunt, ghostly huntsmen passing in wild pursuit, a threat for the living. But it is said as well to maintain the balance between life and death. In our first role we play as the huntress. We meet Ull, god of living hunters, who gives us a background on the wild hunt, how Odin is originally responsible for their existence. As often, things go out of hand and even though Ull has no idea who summoned those dead wild hunters and why, he tries his best to help. The Hunt is basing on the other games, it is a series, where you continually progress on your ways with the same protagonists. A summary is given at the beginning and you can read about previous adventures in your journal, where you may look up terms and other useful hints. Features, like the HOS and puzzles, are not difficult and you won’t stumble over them every two steps. So the plot can unfold in an acceptable pace. As for me, games like this one, need a good story in the first place, even less HOS would have been sufficient. Puzzles are placed mostly in places, where you feel them as a logic step to go on. The visuals are stunning in this monumental game. All, who like this dive into the world of Nordic Mythology again, should take theirs bows and arrows and go after the Wild Hunt! Rated 4 out of 5 by yowzasma from Storyline Different & A Fairly Enjoyable Game I really liked the graphics/visuals, story-line, sounds/music and voice-overs but did not much enjoy the Mini-game heavy gameplay period ! I thank the Dev's for their innovated story and graphic but please -- more hidden object scenes. The only thing I did not care for was the lack of what to do in a few mini-games but I ether worked it out or skipped it when I started gritting my teeth I did have a problem finding the collectables and finally gave up since I missed something about just what I was supposed to be looking for. So I'm chalking this game up to a visual change of pace and do not know if I will get another one as I played all the previous ones. This one gets a 3 *** and 1/2 * on my personal enjoyability scale. Rated 4 out of 5 by syndney1099 from Not a fluffy escape game! This review is based on the demo only. 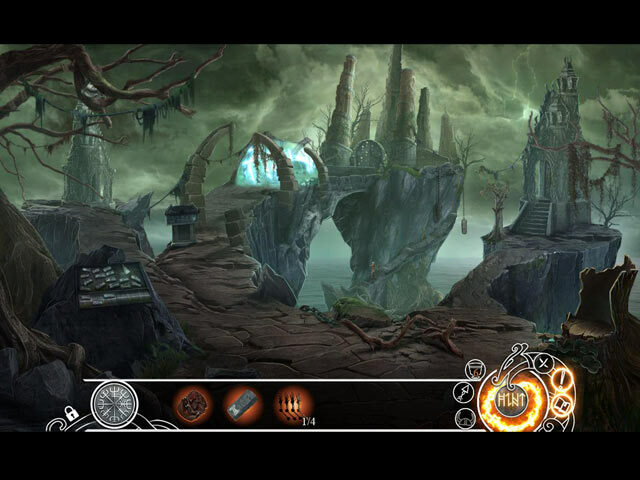 This game is the third installment of the saga of the 9 worlds series. Your "team" of 4 which is nicely reviewed in the opening, is called upon to retrieve the fragments of a horn which can summon "the Wild Hunt" although this is not immediately clear. In the demo, the huntress journeys to get more information and learns she has to find the horn pieces. The storyline is rich in mythology and the tasks are consistent with that. There is plenty of explanation along the way of what is driving the hunt. Some might find it boring. Others might find it helpful to understand the motivation. There is a lot of interspersed information about North mythology although it is woven well in the story. The character is consistently having to "prove" herself in order to move forward. It's nicely done and consistent. The visuals and sound are in keeping with the tone of the story. If you like this kind of tale, it's great. You can get totally enveloped and the tasks make sense. (No zipper pulls with paper clips, making ladders, LOL) The map is very helpful. I agree with a previous reviewer, the bear puzzle needed more instructions but overall the puzzles were good and a decent challenge and worked well with the storyline. I recommend you play the demo and see if it works for you. I liked it as it really was an escape to an interesting time and place. Rated 3 out of 5 by ironhorsejockey from It's okay Kind of fun, but the instructions for the mini games are very poor. Unlike a 100 plus games I have played this "closes" very slowly.